Check out today's pricing and retail availability for Domaine Sainte Leocadie Les Clauses. By way of background, opening thoughts: I've sampled a couple of other offerings from Domaine Sainte Leocadie before and enjoyed them both; specifically the Minervois domain offering and the Leucadios . Today we are sampling Les Clauses, a bargain-priced Minervois that has enjoyed seven years of age since its vintage date. 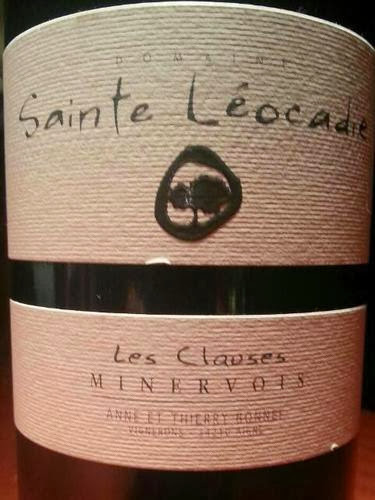 Original tasting and review : This is Anne Et Thierry Bonnet Domaine Sainte Leocadie Les Clauses, Minervois, Languedoc-Roussillon, France, 2006, finished at 13.5% alcohol. In the glass: Medium red brick in the glass. On the nose: Poured at room temperature and swirled vigorously, shows delicate light purple aromatics with a light mineral flair. From the aroma, seems like this will be intriguing, light and friendly. On the palate: The primary elements on the palate are in fact delightfully aromatic with lavender and light fruit, with a full palate of gentle red fruit, slightly sweet, undergirding the aromas. Fresh, slender, lengthy, light and lithe finish that leaves a smile. In summary: Overall, an immensely enjoyable and feminine, aromatic experience that rates four stars on the five-star Spirit of Wine scale. Completely remarkable, show-stopping best value at its ridiculously attractive price point. One word: wow. (c) Copyright 2013 Spirit of Wine, all rights reserved. If you are a winery, distributor or marketing agent and you would like to see your (or your client's) wine featured at Spirit of Wine, here are two options: 1) Wait, pray and hope - we may find you someday; 2) Submit a wine for review. No charge. Particulars are here. If you are reading this full posting on any site other than Spirit of Wine, chances are it is a copyright violation.